Get Automated with SEMrush PDF Reports! 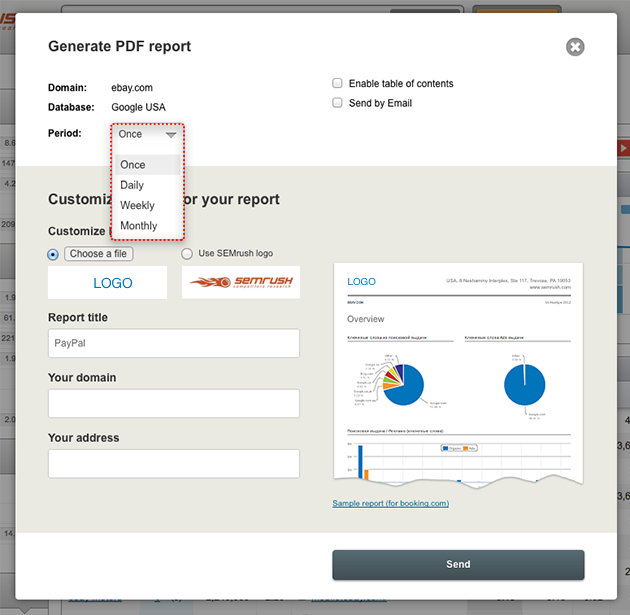 Now you can get automated SEMrush PDF Reports whenever you want them! Your PDF Reports can be easily scheduled for delivery to your inbox daily, weekly (on a particular day of the week), and monthly (any day of the month). - Your Reports where you will find reports you created manually. - Scheduled Reports where you can easily manage tasks for PDF Report auto generation. In this table, you’ll find several columns including: Period (generation frequency), Operations (the ability to delete a task or put it on hold), etc. - Customize Header which allows you to create Branded Reports. The number of scheduled PDF Reports available through The SEMrush Pro Plan is limited to 5. With the Guru subscription, you have the ability to auto generate 20 PDF reports, and the Enterprise Plan offers 50. Make your SEO life easier with SEMrush PDF Report auto-generation! SEMrush is Nominated for a European Search Award!